I am a memoir novice. I’ve read a few good ones, but, other than my self-indulgent journaling years, have never considered writing in depth about myself and my life. And, while we’re on the general subject, what exactly is the difference between a memoir and an autobiography (which my journals also were not)? Norton differentiates in this way: memoir is a “slim section (of a life), full of power, that demands to be told.” An autobiography is a chronological overview of an entire life, from birth to present. In helping aspiring memoirists find their footing, Norton also addresses another tricky issue: truth versus fact. Most writers want a story to be honest in the telling. But memory is fallible, and what if we’re not sure that events transpired the way we remember them? This is especially challenging when our truth might make for some awkward family get-togethers. “Writers of life stories,” Norton writes, “are not journalists….Facts over emotional truth is not the point.” In short, be accurate when possible, and write with compassion the truth of your life as you know it. But what to write about? For some memoirists, that isn’t a problem. The aforementioned slice of life stands out like a billboard. For others, the process will be more like picking through a box of memorabilia. Go slow, Norton writes, go deep. And keep an eye out for the “shimmering images,” the memories that rise “in your consciousness like a photograph pulsing with meaning.” They won’t surface all at once or in the logical order of a novel’s plot outline, so take a lot of notes. Expect to wade through at least a couple of messy drafts, but that’s par for the course with writing in general, right? 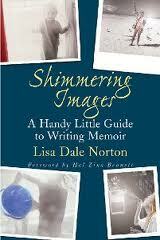 This small book offers much wisdom and inspiration for beginning and experienced memoirists alike. I may not be ready to jump into that type of project, but I’m going to try to pay more attention to the shimmering images that appear before my mind’s eye. Are you working on a memoir? Pat, sounds like a great plan! You've enticed me to get this book with the "dead-on" advice and beautifully crafted language. Thanks for inviting me to mine for "shimmering images." Cathy, thanks for stopping by. I hope the book inspires you! Sometimes the best books are few pages. Thanks for visiting my blog. I hope you do write your memoir. I'd read it.